Whip thread down shank of hook toward bend, starting at 1/6 distance from eye. Tie in lead wire. Use lead to form underbody tapering towards eye end. Treat with varnish. Take short length of baby wool and burn one end to form a head (usually only one strand of the wool is necessary). Tie in baby wool along shank to increase body volume, with burned head end extending to or just beyond the bend of the hook. Tie in black hackle and copper wire immediately behind head (a little white wool body should be visible infront of hackle). Make 2 turns of the hackle and tie off. 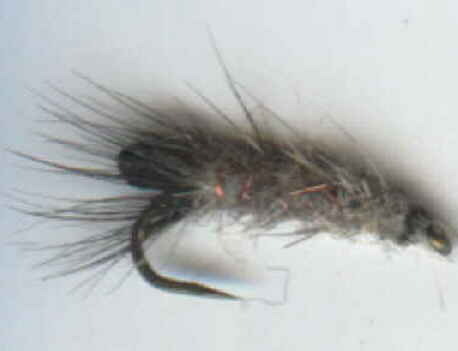 Now use cat fur to dub body from behind hackle, back along shank to finish immediatly behind eye. Wind fine copper wire toward eye to rib body in 6-8 equal turns. Tie off.